There are at least three artist who use the name : 1) Koan is an ethnic ambient duo from Russia. Koan are Daniel Roeth & Vladimir Sedov. Location: Moscow, Russia Style: Ethnic Fusion/Lounge Equipment and programming: Logic, Samplitude, Sound Forge Side projects: Vacuum Stalkers, Metanoya Koan is the Duo comprised of Daniel Roeth and William Grey, and are based in Moscow, Russia. Daniel had been spinning vinyl since 1993 in local clubs; mainly Acid and Hard Techno. In 1995 he met William, who already had some experience in music making and sampler technologies. 1) Koan is an ethnic ambient duo from Russia. 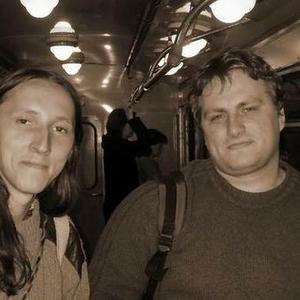 Koan are Daniel Roeth & Vladimir Sedov. Koan is the Duo comprised of Daniel Roeth and William Grey, and are based in Moscow, Russia. Daniel had been spinning vinyl since 1993 in local clubs; mainly Acid and Hard Techno. In 1995 he met William, who already had some experience in music making and sampler technologies. Together they founded two projects, "Koan" for Downtempo and "Vacuum Stalkers" for more Progressive/Tech stuff. Daniel soon left his career as a DJ and put all of his energy into the studio work. William took on the role of Sampler Programming/Producer. During 1995-2005 they wrote and recorded a lot of tracks, some of which disappeared in time bubbles and some of which were released and had a lot of success in local Moscow clubs. The real success came after the release of their first album "Talking Stones" (otium net label 2005) and their second album release "The Signs" (otium net label 2005). Some well known labels like Iboga/Sofa Beats have released their tracks and Daniel resurrect his DJ performances under the name Chillout DJ. Their music in clubs and open air chill areas are popular and very well received. At the end of 2005 they collaborated with the crew from TrancExplorer, which resulted in this piece of work. "Two Moon Butterflies" takes you deep down into the deepest places of your soul, makes you feel like a butterfly who needs to go up, to the light, to the moon. They released "When the Silence is Speaking" in late 2009. 2)The band Koan on the English label D.O.R. The Middle and Near East influenced this Koan's music, crossing genres, ideas and cultures - Persian, Punjabi, African and other ethnic instruments and styles are blended with western bass lines, guitars and drums. Members were Martin Lee Stephenson, Tabla player Kuljit Bhanra, Persian Music expert Christoph Bracher, drummer Lol Gellor and singers Faye Rochelle and Anita Masih. 3) Koan is a dark metal duo from France. The French Koan is a very short lived side project of Zahaah, a French musician, who's most known from his involvement in Himinbj?rg, a black/viking metal band, who in the Koan project, is aided by Christophe Pion-Chozenon. The band released only one album, "Frontiers", in 2000, and then split-up. Koan plays ritualistic dark ambient, oftenly aided by clean and screeching vocals. 4) Koan is a hip-hop MC and musician from New Orleans, Louisiana. Koan spent a number of years touring with the band EOE. They are a combination of hip hop/jazz/funk/latin music featuring a three piece band as well as Koan's vocals. The band has covered over 80,000 miles touring since they embarked on their first outing the weekend hurricane Katrina hit New Orleans, and has received 6 Best of New Orleans Awards in 2008 including Best Live Show and Best Hip Hop Act. In 2011 Koan embarked upon his journey as a solo artist, releasing his debut album, Chronicles of a Dying breed. The album features a distinct "underground" hip hop style and a dearth of original musical beats by producer Sean C, and featuring a number of New Orleans musicians. Koan is currently touring and gaining exposure in the rap game while promoting his independent record label, Daily Bread Records.